Toy Shot is an application for iPod touch and iPhone by GAMEVIL Inc. that blends the style of play from Angry Birds with the strategy of war apps in a Lego-like world of toys. In it, players lead one warrior, the Hero, against the Undead Warriors to rescue a princess and end the spreading threat of violence. The basic idea of Toy Shot is similar to the popular bird flinging application by Rovio in that players fire various weapons at constructed towers and rebel soldiers. Each weapon has unique traits and strengths, including powerful missiles, fuse-delayed cannon balls, and boomeranging projectiles. 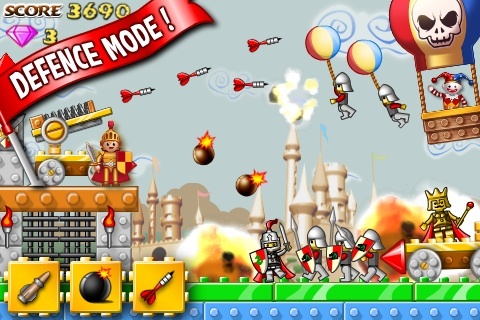 Users conquer 100+ levels and defeat six bosses until they reach the end and rescue the princess. Levels are completed once all the attacking forces have been eliminated and bosses are defeated once a red meter near the top of the screen clears. To fire weapons, players press and drag a target located in front of the launching pad. A red circle increases in circumference towards a blue line and the larger it becomes the more velocity a player has behind the weapon. The angle is adjusted by sliding the finger (or the cursor) around the circle. A red radius indicates the angle. After the first shot, a blue radius shows the angle from the last attack. Spaced white dots show the path until first contact. The graphic composition looks like a mix between Super Mario Bros. and Lego. Most of the constructed obstacles are similar to the 8-bit graphics of the Nintendo and include the same color schemes. This is most likely because of the title and aim of the product. Some of the matte-styled backgrounds employ the same technique. A few of the night scenes include a crescent moon with decent shading and shadowing. However, most of the play is designed around the world of toys and bright colors. Most of the levels are accompanied by a rhythmic drum-beating with an up-paced tempo. This plays throughout each level. A tightening drawstring can be heard when aiming, despite nothing actually happening with the firing mechanism. Everything else, including the firing of the weapon, it’s impact, and the devastation are basic and simple. Level completion sounds and menu operation overlays are childlike. This is not a sound-effect enthusiast’s dream. Although this is toy-themed, the sound could be better. The game sells for just under a dollar from the iTunes store. For that price, the level of engagement and entertainment this game brings is a value. While it’s not an audio-visual pleaser, this iPhone app will challenge the mind and keep users playing. AppSafari review of Toy Shot was written by Darius Reimm on December 21st, 2011 and categorized under Action, App Store, Featured, Fun, Games, Platformer, Puzzler. Page viewed 4274 times, 1 so far today. Need help on using these apps? Please read the Help Page.